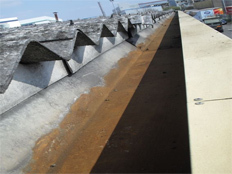 The increasing ferocity of rain storms in the past few months has made FM managers of large warehouses very aware of how important it is to maintain all roof gutters and siphonic - drain systems in perfect condition if they are not to experience severe ingress of water into the storage areas. Sludge and even soil with vegetation soon builds up. 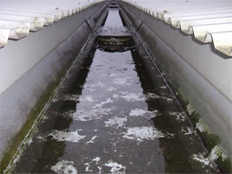 Distribution Hygiene Services offer an annual or bi-annual commercial gutter cleaning service that ensures that all the gutters and drains are kept in perfect condition. Siphonic drains and overflow systems need to be regularly cleansed and tested if they are to cope with the substantial amounts of prolonged rainfall. A gutter not fit for purpose. An After-clean Report is produced at the end of the process, with any refurbishment requirement or operational issues that have been identified being reported. 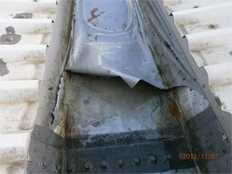 If serious damage has occurred, gutters can be repaired or completely refurbished. All of our operatives have been trained and licensed for working at height, they also hold IPAF certification for the operation of access platforms. 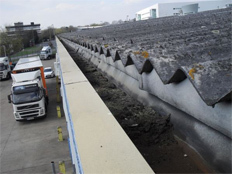 A revolutionary piece of engineering for the renewal of complete gutter systems has been perfected by Ampteam and known as the Unifold Gutter System and Distribution Hygiene Services have been trained and are registered as approved contractors to this product that offers a twenty year warranty. Distribution Hygiene Services Limited work throughout the UK and are prepared to provide a free site survey and quotation for regular annual or bi-annual gutter cleaning. As with all our services, we also provide detailed Method Statements and Risk Assessments.